A Web portal is a Web page that provides an entry point to the World Wide Web. AOL paid $9.6 billion for Netscape just to get their popular Web portal. * Now you can make your own Web portal for free with the Amazing Portal Generator. RTG's Amazing Portal Generator (the APG for short) lets you design your own Web portal. Choose links from a list we provide or add your own. Choose buttons from a list of pre-coded buttons that you can customize. Buttons can do a Web search, get a stock quote, or retrieve a local weather forecast. You can customize your portal with your choice of colors and fonts. When your design is complete, the APG writes your Web portal to a disk file. 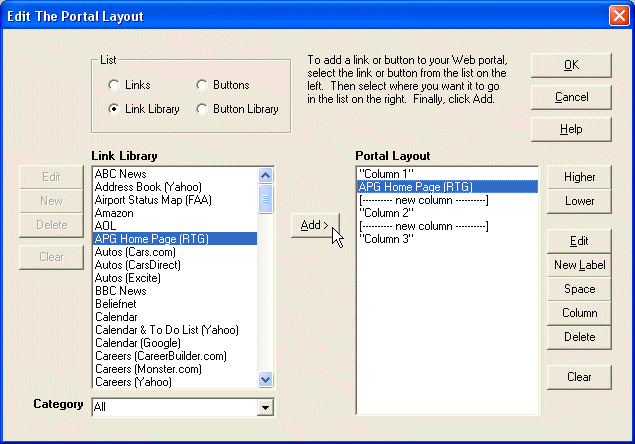 Then the APG can start your Web browser to display the portal. You don't need to know HTML, the language of the Web, to create a Web portal with the APG. Your design specifications are translated by the APG into the appropriate HTML commands. This program is freeware. We ask that you register by giving us your email address so we can contact you with news about the APG. *You can decide for yourself whether they received anything else of value in this deal. Of course, that was $9.6 billion in stock, not cash, valued at the time it became official in March 1999.